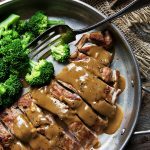 Delicious, quick and easy dinner, with pork tenderloin, grilled or broiled, then sliced and served with an Indonesian-style peanut sauce. Serves 6, but halve the recipe for starting with a single pork tenderloin to serve 2-3. In a large bowl, whisk together the coconut milk, peanut butter, soy sauce, lime juice, brown sugar, garlic, and coriander to make a smooth sauce. Trim the pork of excess fat and silverskin. Butterfly the tenderloins by splitting each one lengthwise almost, but not quite all the way through, so the halves remain attached. Open each tenderloin like a book, cover with plastic wrap, and pound to an even 1/2-inch thickness with a meat mallet or the bottom of a small skillet. Put the pork tenderloins in the bowl with the marinade and turn to coat. Let marinate for 10 to 20 minutes on the counter (or up to several hours in the refrigerator). While the pork marinates, heat a BBQ on high. Remove the tenderloins from the marinade, letting the excess marinade drip back into the bowl (don’t discard the marinade). Grill the tenderloins, turning once, until just cooked through, 5 to 7 minutes total. Transfer to a carving board and let rest for 5 minutes. *Alternately, preheat oven broiler to high with rack about 6-inches from heat. Place tenderloins on a foil-covered baking sheet and broil, turning once, until cooked through, about 10-12 minutes. You could also cook in a large grill pan on the stove-top. Meanwhile, pour the remaining marinade into a small saucepan and add 1 Tbsp. water. Bring to a boil then reduce the heat and simmer for 3 minutes. Remove from the heat. If the sauce seems too thick, thin it with a tiny bit more water. Slice the pork and serve drizzled with sauce. Additional sauce can be placed in a small bowl for passing.